Christian Lacroix - Rouge is a perfume by Avon for women and was released in 2007. The scent is floral-spicy. It is still in production. One of the very best perfumes of Avon and Lacroix. Oriental indeed, very long lasting, 1st class package and bottle. This is my 2nd botte because I was so very pleased from the first time I tried this perfume. It does not smell at all cheap, on the contrary it can be compared to other best sellers as "Euphoria" or "Ange our Demon". I could wear it all year round. I have also tried "Absynthe" and "Nuit" and from my experience they are all worth every penny, so do not hesitate at all and try them . You will be highly surprised from all the compositions. Excellent job Mr Lacroix and Avon. The snob in me often prevents me from trying many inexpensive fragrances. Seeming that an offer for a sample of Rouge came my way recently, I decided to give it a shot. Well, thank goodness I did. 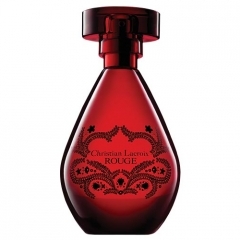 Christian Lacroix Rouge is quite a complex and pleasing blend. However, I must admit that it takes some getting used to. It starts off a little masculine, with heavy pepper and zesty orange. It's not unpleasant in any way, although it is less feminine than you might expect it to be. The heart is my favourite bit, with a beautiful and refreshing blend of peony, osmanthus and lotus. Although it isn't just florals on their own, the pepper counteracts well with the green, and somewhat sweet floral nuances. Rouge tends to smell very unisex to my nose. I have really enjoyed wearing it, and I agree with other reviewers, that it does indeed emit a certain aura of sensuality. If you don't mind strong pepper in your fragrances, Rouge is worth testing. I was really impressed, almost blown away by the great lasting power of Rouge. I spritzed it on early in the morning, and I'm still enjoying it on my skin ten hours later. I would describe the sillage as moderate. I found Christian Lacroix Rouge an intense, peppery scent with a slightly serious side. CL Rouge opens with a slightly spiced, sickly fermented orange, like a very ripe, sweet orange peel just before it starts to mold. Then the attention turns to florals - a nice peony before movement to lighter, watery flowers, at which point CL Rouge just sorta peters out. CL Rouge seems built around the top notes without any regard for wear past 30 minutes. CL Rouge is a strange & unique offering by Avon. Ironically I like it but not enough to invest in a bottle. Below average and rightly discontinued. CL Rouge is the result of an Avon/IFF partnership. The correct name for the fragrance is Christian Lacroix Rouge BY AVON. Currently, the fragrance is mis-listed as Rouge by Christian Lacroix. Don't get price-gouged on fleabay. Rouge was listed under $20 retail at Avon. It can often be found at buy.com or the O at a discount. Full-sized tubes of lotion & shower gel were clearanced for $2.50 each at Avon dot com. Write the first Review for Christian Lacroix - Rouge!